Life in ancient Egypt under the pharaohs was neatly ordered. Herodotus tells us, “Now of the Egyptians there are seven classes, and of these, one class is called that of the priests, and another that of the warriors, while the others are the cowherds, swineherds, shopkeepers, interpreters and boatmen.” The lives of the pharaohs could be harsh and brutish. One, named Sesostris, was returning from having conquered foreign lands and stayed with his brother. At night, his brother put brush around his house and set it alight, hoping to burn the pharaoh alive with all his sons. Sesostris hit on a way to escape: he made two of his own sons lie down in the fire “to make a bridge over the burning mass, and that they, passing over their bodies, should thus escape.” Needless to say, he escaped. Today the pharaohs are gone, but the world still has kings. There are 23 monarchies in the world, from tiny Liechtenstein’s aptly named Johannes (Hans) Adam Ferdinand Alois Josef Maria Marko d’Aviano Pius von und zu Liechtenstein, to the stocky and elegantly attired King Tupou VI of the island of Tonga. There are also three emirates in the world and one sultanate. In addition, 15 commonwealth countries all swear allegiance to the queen of England. Around 500 million people live under these royals. Together, they control more than $200 billion in wealth. The interest in these pharaohs is a constant media obsession. Even laymen see their world as exotic. One Yahoo Answers web page asks, “What is it like to live in a monarchy?” The commenter wonders, “I’m kind of curious, for I live in America, and I don’t really know what it is like to live in a monarchy. How does the government impact the way people live? And is there any manipulating, and do people go to jail a lot?” Another website devoted to answering everyday questions asks, “What are some of the advantages to living under a monarchy?” Devotees think monarchy is wonderful; the monarchist league of Canada claims that citizens falsely assume the queen is a “foreigner.” But isn’t she? 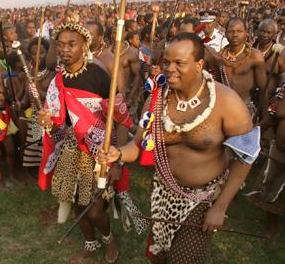 Even if the British queen is relatively benign, there are more quixotic types out there, such as King Mswati of Swaziland who has at least 15 wives, and selected his most recent wife as a “virgin bride”: an 18-year-old beauty pageant contestant. Yet he still has a lot of catching up to do, as his father, Sobhuza II, had more than 125 wives. As it turned out, in the period after Uganda received independence, his father, Isaya Mukirane, had led a rebellion against the country. Charles grew up fighting in the mountains before being able to move to the US. But in a sort of I, Claudius turnabout, he was suddenly able to return to his people several years ago. Although he now wears a suit and looks the part of an important figure in Uganda, his life is apparently not without problems. When he has attempted to celebrate various kingly holidays in his homeland, such as “Environment and Heroes Day” and “Peace Day,” the government has asked that he move the celebrations closer to his royal palace, so as not to cause tensions. Clashes between various ethnic groups are not uncommon, apparently. Either way, it is evidently more satisfying than being a nurse’s aide in the broken US healthcare system. THE SULTAN of Oman is a single man. Kaboos bin Said al-Said was born in 1940, but looks much younger than his years. He has five super-yachts, one of which is a specialized tugboat where the “lesser guests” are left adrift. He is obsessed with orchestras, and has developed a unique system of taking boys at a young age and grooming them to play in his personal ensemble. There are rumors that the sultan does not like women, and he has produced no heirs, which leaves the kingdom’s future in doubt. The Omani Royal Handbook tells a slightly different story, however, saying he took over a country living in stagnation and with a “complete lack of infrastructure” and brought it tremendous advances. “The sultan feels it very important to meet with the people, and every year he travels to different parts of the country to see what can be done to help the needy,” it says. Thai King Bhumibol Adulyadej does not like being insulted. Under strict laws in the country, anyone found guilty of defaming or insulting the monarchy can be sent to prison, as journalist Somyot Prueksakasemsuk found out in January 2013 when he was locked away for 10 years. A 60-year-old man was jailed for 20 years for sending text messages deemed offensive to the royal family. In another incident in 2011, used car salesman and US citizen Joe Gordon was sent to prison for two and a half years for putting a link on a website to a banned biography of the king. So, needless to say, if you travel to Thailand, be aware. Adulyadej, who was born in 1927, has reigned since 1946 and played a moderating role during the years of the Vietnam War, keeping the country on the side of the West. He also helped the country transition to democracy in the 1990s. He has been a keen inventor, with a particular interest in water filtration problems. One website devoted to his inventions notes: “His Majesty used the local method of the villagers, called luk (water wheel), as a model to invent an aerator which is simple yet highly efficient in treating waste water with satisfactory results.” On receiving a reward for his work in Belgium, he was called “a developer king.” He also plays jazz. ONE OF the most handsome royal sovereigns is thought to be Jigme Khesar Namgyel Wangchuck and his wife, Jetsun Pema, of the small Buddhist kingdom of Bhutan, which lies perched in the Himalayas. Japan’s Emperor Akihito presides over one of the longest-surviving monarchies, dating to the seventh century BCE. His father, Emperor Hirohito, reigned during World War II, and Akihito actually had to be evacuated from Tokyo because of the bombing. Akihito ascended to the throne in 1989, but has not always expressed a love of the job. Once he compared his work to being a robot. He has devoted himself to studies of marine biology and examining the history of science in Japan. Although the modern-day kings may not be as cruel as the pharaohs, they have many bad habits. The king of Saudi Arabia’s two daughters recently made headlines as Princesses Sahar, 42, and Jawaher, 38, reached out via Skype from a palace prison, claiming they have been locked up for years. Other monarchs are more benign, looking more like yachting buddies and crass golfers than threats to the poor and weak. Either way, their ilk will surely be with us for years to come.